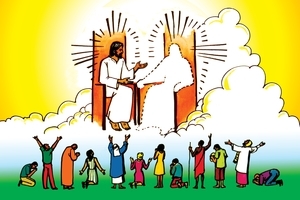 रुपरेखा: (Dialogue) Jesus taught His disciples after His resurrection and then went back to Heaven where He is now. He will come again. Those who don't follow Jesus will be punished forever. Testimony of what Jesus means to someone. Prayer to receive Christ. How to grow as a Christian. Don't wait to follow Jesus. (Monologue) Jesus taught His disciples, then went to Heaven. Jesus will return and take people who believe in Him to Heaven, those who don't believe in Him will be punished forever. Jesus died so we could go to Heaven. Jesus took our punishment. Follow only God, leave your sins. Decide for Christ today. 2: Greetings. The things you have been saying are true and wonderful. It has been very good to hear about Jesus' life. 1: Yes, these are things we need to tell others. Are there more things you would like to hear? 2: Yes, after Jesus died and rose again tell me how He appeared to His disciples. 1: After Jesus rose from the dead, He continued teaching His disciples about living to please God. Then after 40 days Jesus gathered His disciples together. He told them to tell others about Him. All the (Tribal Name) people and all people of the world need to hear about Jesus the Son of God. That's why I've been telling you these things. 2: People sometimes ask me where Jesus is now. 1: After He talked to His disciples Jesus went back to Heaven. Many people saw Him, still alive, go up into the sky. He is in Heaven now with God His Father. 2: I'm so glad He is not gone forever. I know He will come back one day. 1: While Jesus was still on earth, He promised His followers that He would return one day. When Jesus returns He will come with great glory, the glory of God. Every one will see Him. Every one will bow to Him as Lord. He will gather together those who believe and obey Him. He will take them with Him to Heaven. They will be there forever with God. In Heaven there is only peace and joy. There is no sorrow or suffering. 2: That sounds wonderful! It will be wonderful for those who follow Jesus, but what about those who don't follow Him. 1: Those who do not believe and obey Jesus will be punished forever. They will be sent away from God. They will go to the place of eternal fire and eternal suffering. 2: What a bad place! 1: It grieves God very much to send them to this place. He loves the (Tribal Name) people and every tribe of people very much. He loved us so much He sent His only Son Jesus to die for our sins. It pained God to see His Son suffer and die. But He did it so that each one of us could be able to return to Him. 2: I see how much the God Who made us really loves us! When I first understood God's love for me, my family did not believe this. I was afraid they would all reject me. But even with those difficulties I understood it was more important to follow Jesus. 1: Now my friend, we've talked about these important things. Tell me what Jesus means to you. 2: Jesus is my Savior and my Lord. He died in my place. I am very thankful to Him. When He called me to follow Him, I left my old ways of doing only what pleased me. I now try to do what Jesus wants me to do. Sometimes this is not easy. There is a struggle when what I want to do is different from what Jesus wants me to do. I am learning to say "No" to my self and "Yes" to Jesus. He gives me guidance through His words. I did not have peace with God until I gave my life to Jesus. I am not saying that I never have difficulties. I do. There are problems that come. I am learning to pray about problems. I am learning that Jesus gives me wisdom and strength to deal with them. 1: How do you feel about those who do not follow Christ? 2: I feel sad. Jesus said, "Wide is the way that leads to destruction and many are those who follow that way. Narrow is the way that leads to eternal life and few are those who find it." 1: What you have said is right. Those who keep remembering what Jesus has done for them and keep obeying His words are real Christians. my Father. Make me truly one of your children. Amen." God will give a new heart to you who believe in Jesus. He will give His Holy Spirit to be with you and help you. If you have received Jesus you should daily listen to God and obey Him. You should pray to God every day. Tell Him all that concerns you and He will show you His way. Meet regularly with other followers of Jesus. The Holy Spirit will give you strength to do what is right. This is God's good way for you. Don't wait until tomorrow. It may be too late. Follow His way today. My people, my friend and I and many others have decided to follow Jesus. What about you? If you want to follow Jesus or know more about him, you should talk now to a pastor or evangelist or someone you know is a Christian. After Jesus rose from the dead, He was with His followers for forty days. He continued teaching them about God. He also taught them about living to please God. Then one day Jesus gathered His followers together. He told them to tell others about Him. All ......... (use name of group) people and all people of the world need to hear about Jesus the Son of God. After this, Jesus went back to Heaven. Many people saw Him, alive, and ascend into the sky. He is in Heaven now with His Father. While Jesus was still on earth, He promised (told) His followers that He will return one day. When Jesus returns He will come with great glory, the glory of God. Every one will see Him. Every one will bow to Him as Lord. When Jesus returns, He will gather together those who believe and obey Him. He will take them with Him to Heaven. They will be there forever with the good God. In Heaven there is only peace and joy. There is no sorrow or suffering. But those who do not believe and obey Jesus will be punished forever. They will be sent away from God. They will go to the place of eternal fire and eternal suffering. To send them to this place grieves God very much. He loves the ......... (use name of group) people and every tribe of people very much. He loves us so much He sent His Son Jesus to die for our sins. It pained God to see His Son suffer and die. But He did it so that each one of us could be able to return to Him. Now, my people, you have heard these messages (this talk) from God's Word. You must choose how to respond (answer). God is offering you the great gift of eternal life (salvation) through Jesus Christ. We know that we all sin against God and against each other. God required some perfect sacrifice to pay for all these sins. But there is only One who was perfect. Jesus didn't have any sin to die for. No, He died for your sins and my sins. On the cross, God put the punishment for our sins upon Jesus. This way, Jesus paid the price for our forgiveness. God will accept (pardon) those who are in Jesus (those who follow Jesus). But God will punish those who do not follow Jesus. Jesus is the only Saviour. God loves us so much that He planned this great (wonderful) way for us to be saved. My people, to follow Jesus, you must believe that He is God's only Son. You must believe that He died for your sins. You must believe that He arose from the dead and is alive today. You must also turn away from (leave) your sin. You must leave bad ways such as lying, stealing, hating, running after women, evil thoughts, and drunkenness. You cannot follow the way of sin and also follow Jesus. Do not follow other gods (idols) or give honor to (obey) evil spirits. Follow only the true God. My people, be wise. Leave your sin and follow Jesus today. If you ask Jesus He will forgive you. You can talk to Him and He will hear you. He will give you a new heart (new insides). He will send you the Holy Spirit of God to live inside you. Listen to God's Word and talk to God every day. Tell Him all that concerns you and He will talk to you too. Meet regularly with other followers of Jesus. The Holy Spirit inside you will give you strength to do what is right. My people, this is God's good way. Don't put it off until tomorrow. It may be too late. Follow His way today. GRN has recorded a version of this script in 397 languages and dialects. See full list. If you have any comments or suggestions about this script, जीआरएन भाषा हॉटलाइन से संपर्क करें.